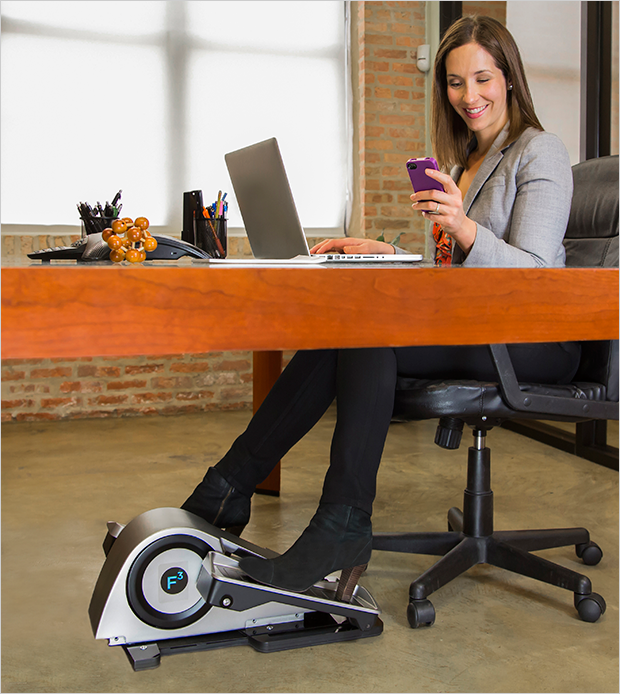 Cubii, by FitnessCubed, is the world's first under-desk elliptical trainer, designed specifically to help office workers everywhere add some much-needed activity and energy boost back into their busy day. Cubii also comes with a mobile app that allows users to track their exercise and compete with friends. In the daily hustle and bustle of life, we often miss out on the one thing that matters the most: exercise. Forget trying to carve time out of your busy schedule to hit the gym, or carve room out in your crammed workspace for bulky exercise equipment: Cubii brings fitness to you in a convenient, compact package that slides effortlessly under your desk. Get Cubii for your office or your home and stop wondering where you're going to find the time to fit activity into your schedule. Because with Cubii, the answer is right at your feet. The past few decades have witnessed a monumental shift in the professional makeup of the American workforce. In the space of just a few generations, we’ve gone from a nation of farmers and factory workers who spent hours on our feet behind plows and in front of assembly lines, to a nation of information workers who spend hours on our rear ends in front of computer screens. There's no getting around it: the only way to bring fitness back into the lives of busy working professionals is to find ways to return activity to its rightful place as an integral part of our everyday routines. But that begs the question: as long as our jobs continue to keep us tethered to our computers and our desks, how do we make that happen, without seeing our productivity grind to a halt as a result? 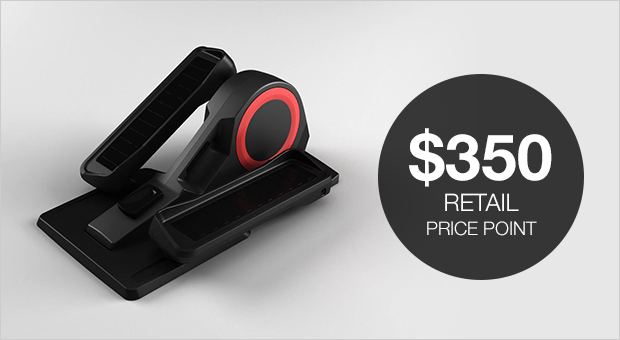 Meet Cubii: a connected, affordable and compact office fitness solution. Cubii is an affordable, accessible fitness equipment solution designed with the lifestyle and priorities of today’s busy office workers in mind. No 21st-century fitness solution is complete without the app to match, and the Cubii app adds a next-generation layer of intelligence to the Cubii experience. Communicating with the Cubii elliptical device wirelessly via Bluetooth, the Cubii app tracks and records your activity, including distance, revolutions, and calories burned. Plus, the app integrates with social media, so you can share your progress and even take on your co-workers in fitness challenges! Cubii is designed to fit conveniently under most standard office desks, so you can make Cubii part of your office or home environment — without having to rearrange your entire layout. 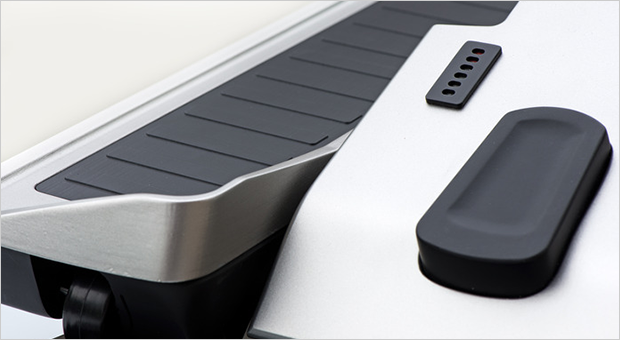 Cubii is also super-lightweight and comes with a full-grip handle for easy portability. 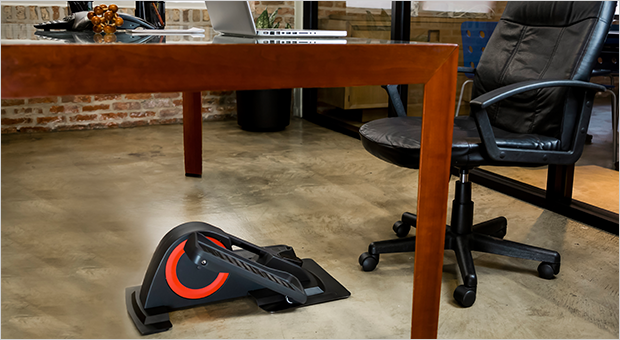 Unlike other under-desk pedal machines that leave your muscles feeling strained, put your legs at awkward angles or send your knees slamming into your desk, Cubii is designed for maximum comfort and ease of movement. Cubii's resistance level is easily adjustable, so you can fit the intensity level of your exercise to your fitness goals — and your professional needs. With Cubii, you can burn as many as 120 calories per hour — without distracting you from the important work tasks that need your full attention. Because fitness need not be compromised. At a brisk 120 calories burned per hour, Cubii offers just enough activity to kick your fitness up a notch — without sending you into a sweat in the process. Beyond just combatting all the negative health ramifications that come with the sit-down lifestyle, the extra kick of activity that Cubii gives you can infuse some much needed energy into your day — both at the office and beyond. The math is simple: more energy, plus a design that is specifically engineered to cause as little disruption to your work as possible, equals the ultimate workplace activity solution. We have a fully functional Cubii prototype, which has been tested by over 40 users at various co-working facilities in Chicago, and we have design and utility patents pending to protect the innovations behind Cubii. 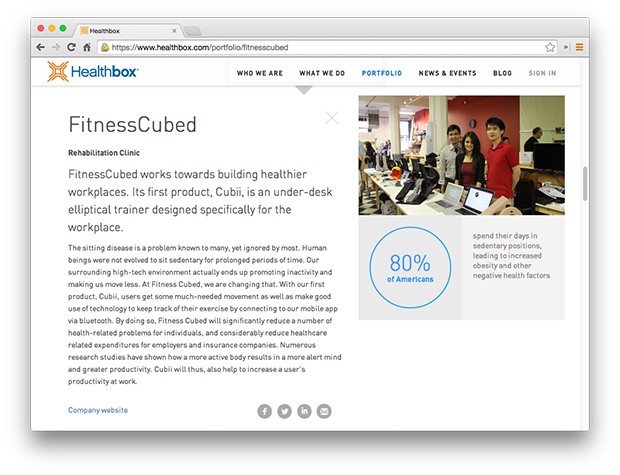 FitnessCubed is a proud graduate of Healthbox, one of the nation’s leading accelerators for inventors and entrepreneurs in the healthcare industry. 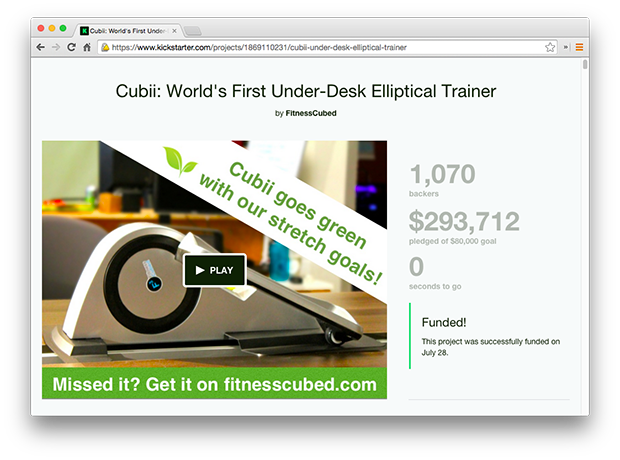 In August 2014, FitnessCubed wrapped up a successful Kickstarter for Cubii, raising nearly $300,000 from over 1,000 backers. Between our Kickstarter and ongoing pre-sales on our e-commerce website, we have a total of 1500 pre-orders for Cubii. With numbers like that, it’s only natural that Cubii is starting to get noticed by retailers. FitnessCubed has received interest from more than 15 global distributors and retailers. And those aren’t the only groups that have been taking notice of Cubii: we’ve been featured in numerous major media outlets, including TechCrunch, the Huffington Post, NPR’s “All Tech Considered” blog, VentureBeat, Forbes, and Foxes News, just to name a few. Up next for FitnessCubed: gearing up for our first production run, scheduled for June 2015, and finalizing pilot programs with a couple of our potential retail partners. For more information about the future of Cubii and FitnessCubed, and to find out how you can be involved, please request access to the Business Plan page of this profile. FitnessCubed is helmed by Arnav Dalmia, Ryota Sekine, and Shivani Jain, a trio of passionate entrepreneurs and who believe in making the workplace healthier, not just for themselves, but for everybody. After graduating from the University of Chicago, they all jumped into corporate jobs, where they spent 8 hours or more sitting at desks in front of computer screens. 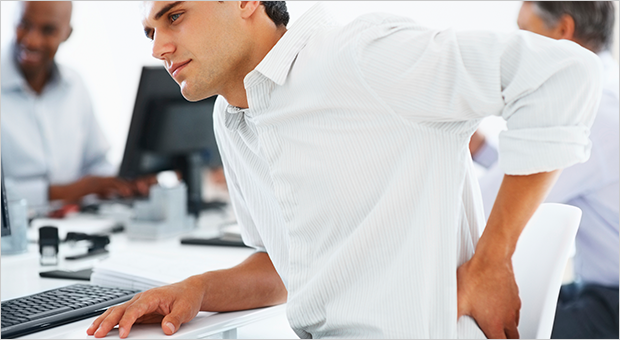 They quickly grew frustrated with how lethargic they felt, and how challenging it was to fit activity into their jam-packed professional schedules. 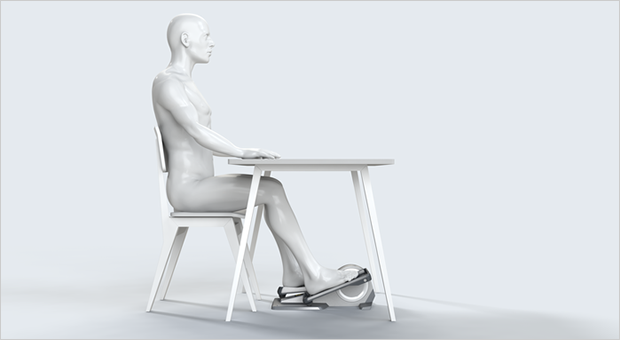 Rather than take it lying down—or, more accurately, sitting down—they decided to do something about it, and design the office fitness solution that they themselves would want to use. 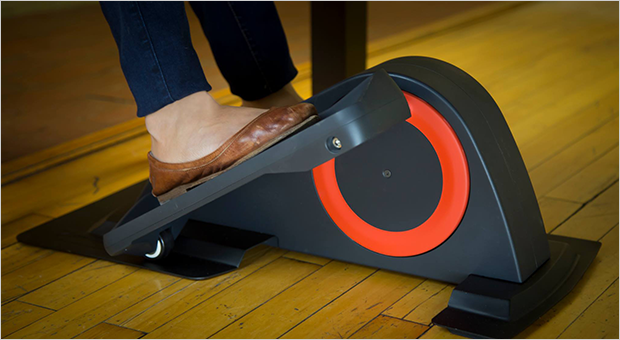 The result of that endeavor is Cubii: the ultimate solution for seamlessly integrated workplace fitness. 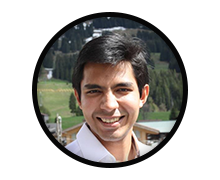 Arnav has over 2 years of experience working with product designers, manufacturers and logistics providers, which he is leveraging to take Cubii from concept to market. 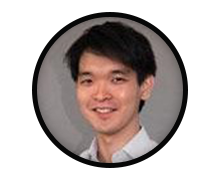 Ryota has more than 2 years of experience with operations management, both at a creative commerce company he co-founded and at a local mobile commerce unit of a major retailer. 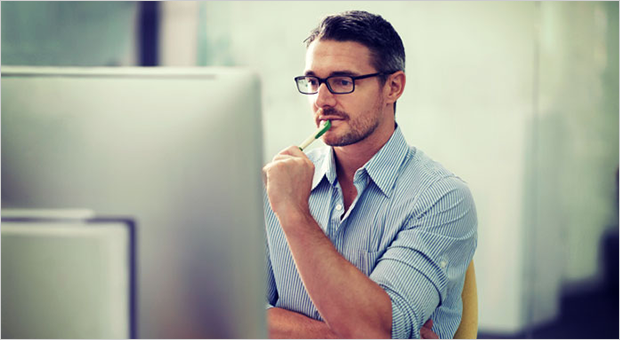 At FitnessCubed, he manages tech development by recruiting and working with engineers. Shivani has more than 2 years of experience selling risk management solutions software to municipal clients through the Cook County Treasurer’s Office, and a major retail company in Chicago. 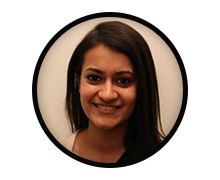 At FitnessCubed, Shivani is in charge of direct-to-enterprise sales of the Cubii hardware-software solution.